Ashley Industrial Molding has been using a Reaction Injection Molding process to make parts for our customers’ marketplaces for years. This capability uses low-viscosity liquid processed using RIM equipment with a self-cleaning mixing head. The two-component system is based on extra-high purity material reacting via a Ring Opening Metathesis Polymerization. 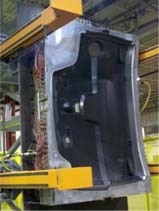 The material is injected into a closed matched metal mold at low pressure and temperatures. Cycle times are usually around six minutes. This system involves lower mold pressure than normal thermoplastic injection molding, and the tooling budget for molds and other production tooling is minimal.